Younger generations tend to have more-positive views than their elders of a number of institutions that play a big part in American society. But for some institutions – such as churches and the news media – Millennials’ opinions have become markedly more negative in the past five years. Since 2010, Millennials’ rating of churches and other religious organizations has dipped 18 percentage points: 55% now say churches have a positive impact on the country compared with five years ago, when nearly three-quarters (73%) said this. Views among older generations have changed little over this time period. As a result, older generations are now more likely than Millennials – who are much less likely than their elders to be religious – to view religious organizations positively. Millennials’ views of the national news media also have grown more negative. In 2010, four-in-ten Millennials said the national news media was having a positive impact on the way things were going in the country, a far more positive view than among older generations (just 27% of Silents and Baby Boomers and 29% of Generation Xers said this). 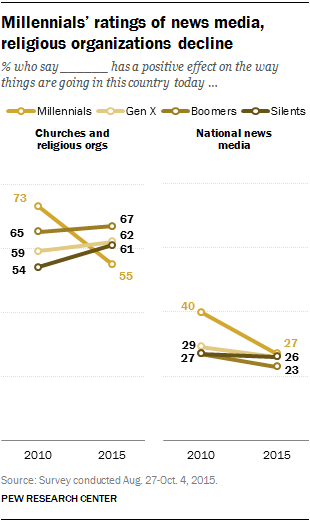 But now, Millennials’ evaluations of the news media have grown more critical and are currently on par with older generations: Just 27% now say it has a positive impact, compared with 26% of Xers and Silents and 23% of Boomers. Younger generations tend to have more-positive views than their elders about small and large businesses as well as financial institutions and labor unions. Views of each of these institutions have grown more favorable over the past five years. Banks and financial institutions continue to be viewed more negatively than positively among adults overall (47% vs. 40%), yet nearly twice as many as in 2010 now say they have a positive impact (40% today, 22% then). And these more-positive impressions are seen across generations: Five years ago, just 35% of Millennials said banks had a positive impact on the nation; today 45% say this. Evaluations of large corporations have similarly improved among Millennials, though they also remain more negative than positive. Small businesses were viewed positively by majorities across all generations in 2010, and those views have only grown more positive in recent years. For instance, 86% of Millennials now say small businesses have a positive effect, up 15 points since 2010. Labor unions are also seen more positively today than they were five years ago (45% now say they have a positive impact on the country, up from 32% in 2010). And Millennials remain much more likely than their elders, especially members of the Silent Generation, to view unions positively: More than half (57%) of Millennials say this, compared with 42% of Gen Xers, 41% of Baby Boomers and just 28% of Silents. Millennials also have more positive views of colleges and universities than those in older generations. Nearly three-quarters of Millennials (73%) say colleges and universities have a positive impact, compared with 64% of Generation Xers, 59% of Boomers and just 51% of Silents. And although technology companies are widely seen as having a positive impact on the country, a generation gap does exist: 77% of Millennials and nearly as many Xers (73%) and Boomers (70%) say this, compared with a smaller majority of Silents (59%). While about half of Americans (48%) view the energy industry as having a positive impact on the country, this view is somewhat more common among those in younger generations than older: 54% of Millennials and 52% of Xers say this, compared with just 42% of Boomers and 35% of Silents.